This week we were just as nervous as last week. We both ate quite well and exercised but it’s always worrying stepping on those scales! We faced our usual challenges this week: not drinking with our friends, fighting the urge to snack, and not giving in to social eating. Not that we succeeded every time… there was biscuits with tea and bites of cheesecake; but all in all, we’re happy with our efforts this week. 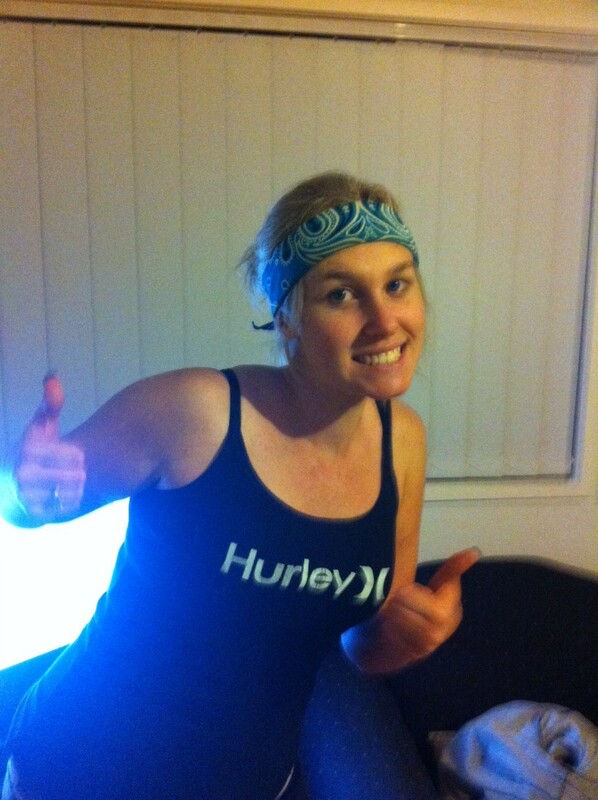 This week Mel was back in Warragul visiting her family on weigh in day. Luckily, we both have WiiFits at home and they are consistent in their weight measurement. We called each other at 7.15am – our weigh in time – and did it on the phone together. Blue Team lost 1.8kg and Red Team lost .1kg. 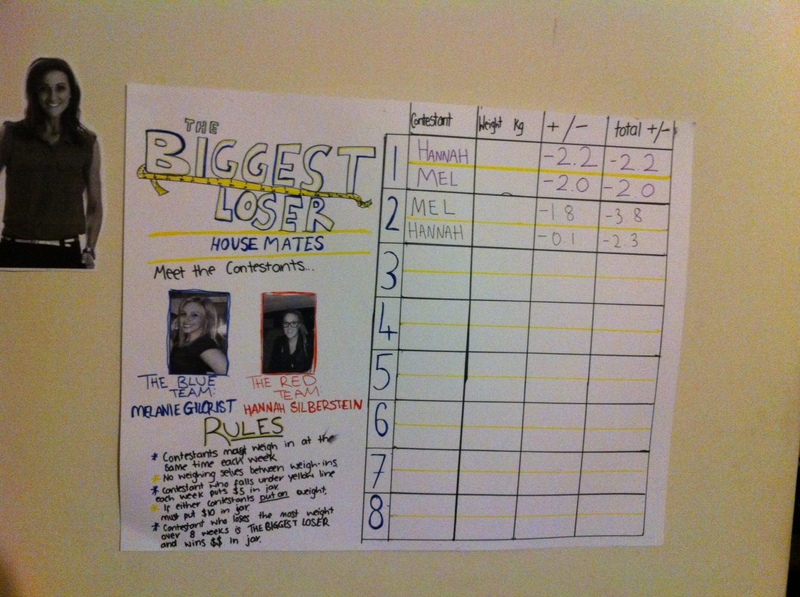 Which means Blue Team is The Biggest Loser this week! Leaving The Red Team below the yellow line, and five more dollars to the jar. Hannah was quite disappointed with this result after working really hard all week. This number might be attributed to all kinds of things; a salty dinner the night before; putting on muscle from three pump classes during the week; or general body fluctuations that happened at an unfortunate time. We don’t know for sure but hopefully (for Hannah) this bad timing means there are good things to come next week! Losing weight is hard, and these things happen. At least we can say she’s maintaining her current loss and can use this for motivation! 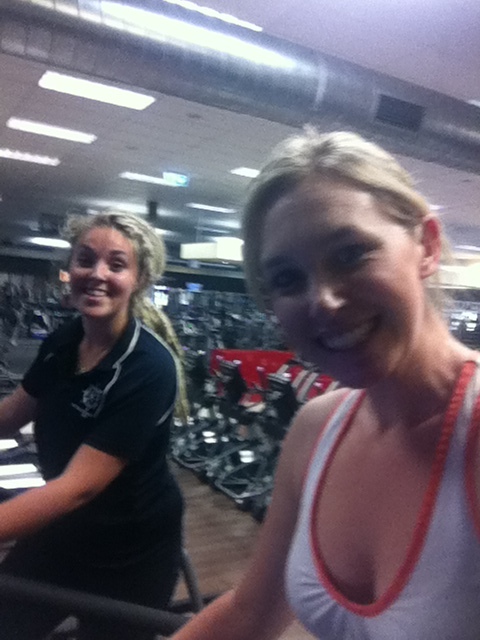 We’re pleased to report that Ash and her sister Hannah are losing weight and enjoying their own TBL challenge! Good luck to both your challenges and we hope to hear some great updates! Next Post Challenge #2: The Bike!.. no.. The Rower! … no… Weights!? Well we three where nervous weighing in this morning. Not sure we had lost anythjng. Mother’s day breakfast of pancakes, few chocies. But we all lost something. Blue team one with 1.5 . Great effort mel n hannah. So much more motivation when this is shared.